Apparently designed to tempt interested parties into buying Time-Life's bigger and more expensive boxed set, The Jackie Gleason Show in Color: Unreleased Episodes may have the opposite effect. Three of the four episodes featured are fairly mediocre, though Gleason is fun to watch. More significantly, the shows are all incomplete, each 50-minute episode hacked to around 42 minutes. Dishonestly, Time-Life makes no mention of this at all on the packaging. Why are they cut? Their 42-minute length suggests one reason, that they were edited for syndication purposes, or maybe Time-Life didn't want to pony-up to clear various music rights issues. What seems to be missing consists mainly or perhaps entirely segments featuring the June Taylor Dancers, presumably dance numbers set to popular songs of the day. However, other segments on the disc include performances by artists like Frankie Avalon and Florence Henderson. In one episode, for instance, Edie Adams does a number built around the song "Cabaret" and that couldn't have been free. But "The Honeymooners" segments proved so popular that, in 1955, Gleason suspended the variety show and The Honeymooners became its own series, the "Classic 39." A mixed success at the time, Gleason reverted back to the variety series format for two more seasons, these including musical "Honeymooners" sketches. For the next several years Gleason kicked around doing various projects, notably several important films like The Hustler (1961), then hosted a game show called You're in the Picture. It was so notoriously awful Gleason stopped it cold after one episode and apologized to the audience the following week, turning the remainder of the series into a short-lived talk show. 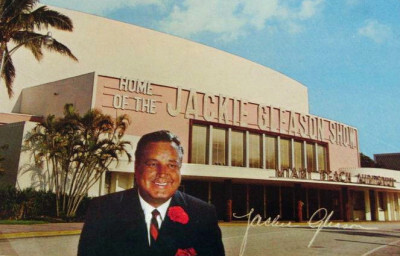 The following year Gleason returned to his roots with a revival of his old variety series, initially called American Scene Magazine and later retitled The Jackie Gleason Show. The program relocated to Miami Beach two seasons later, mainly so that Gleason could play golf year-round. Gleason played his many various characters, but eventually was persuaded to bring back "The Honeymooners." Art Carney returned as sewer worker Ed Norton, though Audrey Meadows and Joyce Randolph were replaced with Sheila MacRae and Jane Kean. Initially the Honeymooners segments were remakes of the musical sketches from the last two seasons of the original variety show, and after that more often than not were adaptations or remakes of ‘50s sketches. When in 1970 CBS decided to radically revamp its primetime lineup, the still popular Gleason show was axed. The episodes aren't well chosen, except for the first, featuring Phil Silvers. Gleason's introduction almost justifies buying the disc. Gleason introduces Silvers as one of the all-time great comedians, and star of television's all-time funniest comedy, obviously referring to Sgt. Bilko. That Gleason, arguably Silvers's only real contender for that same title would be so genuinely earnest in that declaration is really something. When, say, Milton Berle appears on another episode, Gleason tolerates that upstaging, less generous comedian but the difference is striking. The episodes are not well chosen. Red Buttons appears on two shows, doing virtually identical shtick. Edie Adams, so funny and charming normally, does a kind of half-baked nightclub act, complete with celebrity impersonations that are embarrassing, not amusing. An impossibly young George Carlin appears, but his standup is far from his best, he adapting to the family show-like atmosphere. The Honeymooners segments are okay, but they're all slight variations of sketches done better in the past and feel tacked on. MacRae and Kean aren't bad as Meadows-Randolph substitutes, but they feel added more because the TV audience would have been disappointed without them, not because Gleason and Company were excited about doing them again. Gleason, however, chain-smoking his way through hosting duties, really seems to be enjoying himself most of the time, and that enjoyment is passed along to the viewing audience. The absence of the June Taylor Dancers numbers throws the show's rhythm off-kilter, these incomplete episodes simply alternating between the comedy and the songs with the occasional Honeymooners segment. Shot on tape, these episodes look about as good as can be expected. The audio is okay and closed captioning and SDH subtitles are provided. Not much here, sadly, apart from Gleason's ingratiatingness and his warm and funny interaction with Phil Silvers, who does a funny solo segment. The incompleteness of the shows an Time-Life's unwillingness to fess up seriously damages the already slight material. Skip It.